DWS GNMA fund will become one of the popular bond funds for investor to invest. This fund invests mainly in mortgage backed bond issued and guaranteed by US Government. This top rated S&P mutual fund is being reviewed below. 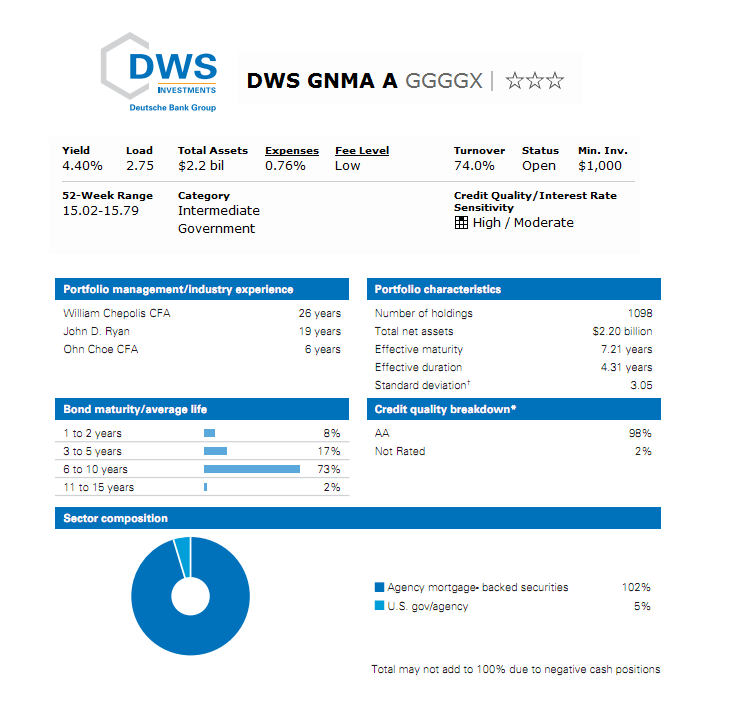 The DWS GNMA Fund objective is to seek to produce a high level of income. This best bond fund invests majority of net assets (>80%) in Ginnie Maes, the mortgage-backed securities issued or guaranteed by the Government National Mortgage Association (GNMA). This DWS fund may also hold <10% of total net assets in cash or money market securities, short-term bond funds, which investments may not be issued or guaranteed by the US government and its agencies. This DWS fund is classified in the Intermediate Government bond fund category. This best fund is currently managed by John Ryan. He has been managing this fund since July 2010. The inception date of this GGGGX fund is February 2, 1999. The fund’s total net assets are $2.26 billion. The dividend yield is 4.27%. The last dividend was distributed on September 23, 2011 ($0.06). The annual expense ratio of this taxable bond fund is 0.76%. This GGGGX fund has 3-star rating from Morningstar. The performance of this fund based on the load adjusted return is 2.44% over the past year, 6.08% over the past 3-year, 5.83% over the past 5-year and 4.77% over the past decade. The YTD return of this fund is 5.70%. The 3-year beta is 0.57. The effective maturity is 7.21 years and the effective duration is 4.31 years. The annual holdings turnover of this government bond fund as of September 29, 2011 is 221.0% (compared to the average of 280.66%). To open a brokerage account in this GGGGX fund, the minimum initial investment needed is $1,000. The 12b1 fee is 0.24% and the front-end sales load fee is 2.75%. The purchase of this fund can be made through 37 brokerages. The other classes of this fund are Class C (GCGGX), Institutional Class (GIGGX) and S Class (SGINX). As of the data for the third quarter of 2011, this fund has 1098 total holdings. The top 5 sectors of this fund as of August 31, 2011 are Mortgage Pass-Thru (78.99%), Mortgage CMO (11.89%), US Treasury (5.04%), US Agency (2.23%) and US Corporate (1.86%).